In 2008, 48 birders participated at Atitlán Volcano, and 42 in Tikal. Read our reports of the CBC Atitlán Volcano and CBC Tikal. 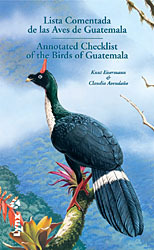 Eisermann, K. & Avendaño, C. (2009) Important Bird Areas of the Neotropics: Guatemala. Neotropical Birding 5: 4-11. Become a member of the Neotropical Bird Club and receive both journals, Neotropical Birding and Cotinga. eBird Guatemala is an online data storage developed by Cornell Lab of Ornithology and National Audubon Society. Register and keep your personal lists of birds seen in Guatemala. eBird Guatemala enables you to see statistics and graphics of bird records you and others reported. By using eBird you make a valuable contribution to the study and conservation of birds in the Americas. Vista Hermosa Bookshop, Guatemala City, 2 Calle 18-50, Vista Hermosa II, zona 15. Libería Sophos, Guatemala City, Plaza Fontabella, Local 1D 2º Nivel, 4ª avenida 12-59, zona 10. Souvenir store in the Tarrales Reserve. Souvenir stores in the visitor's center of TIKAL (next to the Stelae Museum).